Peng, L., et al. Physiological and Quality Changes of Postharvest Strawberries at Different Storage Temperature and Their Relationships to Fruit Discoloration. (2017) J Food Nutr Sci 4(2): 81- 88. © 2017 Peng, L. This is an Open access article distributed under the terms of Creative Commons Attribution 4.0 International License. The changes in fruit color development, fruit quality, reactive oxygen species (ROS) metabolism, and phenolic metabolism of strawberries during storage at 15°C, 25°C and 35°C were evaluated to explore the key internal factors resulting in the fruit discoloration. The high storage temperatures aggravated fruit discoloration as indicated by the decrease of L*, a* and b* values, and accelerated weight loss of postharvest strawberry fruit. The fruit under higher temperature treatments induced more productions of superoxide anion (O2•- ) and hydrogen peroxide content (H2O2), more accumulation of Malondialdehyde (MDA) and lower antioxidant enzyme activities including Superoxide Dismutase (SOD) and Catalase (CAT). For phenolic metabolism, the high storage temperature increased the levels of anthocyanins, total flavonoids and phenolics, and enhanced the activities of relative enzymes including Polyphenol Oxidase (PPO) and Peroxidase (POD) in postharvest strawberry fruit. Further data correlation analysis indicates that anthocyanins accumulation was the most important factor leading to fruit discoloration of post harvest strawberries, followed by ROS and weight loss. Based on present study, the results suggest that fruit color of post harvest strawberry could be maintained through the ways including delay of the anthocyanins accumulation, maintenance of antioxidant activity and reduction of the water loss during storage. Strawberry (Fragaria × ananassa) is one of the most popular berry fruits due to its high content of essential nutrients and phytochemicals, which are proved to be beneficial for human health[1,2]. Besides, strawberry has an attractive red color and flavor, which influence the choice of consumers and strawberry marketability. The appearance of food products is the major importance to consumers with regard to both acceptability and preference. The color of fruit products is generally accepted as one of the most relevant quality parameters. Discoloration of strawberry is undesirable because it results in the loss of fresh color and glossiness in fruit. It has been reported that the strawberries harvested at fully red stage may become darken during storage, making the appearance overripe, dull, and less appealing[6-8]. Fruit color is generally influenced by the internal factors such as pH value, phenolics, Reactive Oxygen Species (ROS), and sugar, as well as the external factors such as light, temperature, oxygen, and metal ions. Temperature is one of most important external factors that significant influence the fruit color. Several studies have reported that the lower temperature induced more accumulation of red pigments in pears and apples than that by the higher temperature. The effects of temperature may depend upon the maturity of the fruit[9,10]. In pineapple fruit, elevating temperature treatment altered the color of the skin and pulp of fruit ripened in low-temperature seasons to be more red and yellow, as well as enhanced the fruit quality and production of aroma compounds. In previous study, we noted that the higher storage temperature accelerated fruit discoloration of the harvested strawberry. However, it has not been not clear for what are the key internal factors influencing color of the harvested strawberry fruit during storage under different temperatures. The objectives of present study were to investigate the changes of fruit color, quality attributors, ROS metabolism, and phenolic metabolism in harvested strawberry fruit, and further addressed relationships among the internal factors and color changes of strawberry fruits in order to explore the key internal factors influencing color quality of postharvest strawberry fruit under different storage temperature. Strawberry fruits (Fragaria × ananassa cv. Sweet charlie) were obtained from the greenhouse of the experimental station in the Hubei Academy of Agricultural Sciences, Hubei province, China. Strawberries were harvested at commercial maturity and placed in egg plastic plates, and then transferred immediately to the laboratory. The selected fruits were uniform in size and color, and free of visible physical injury or disease, and then divided into three groups and stored at 15°C, 25°C, and 35°C individually. Determination of fruit quality attributes: The surface color of strawberry was evaluated on two opposite sides of nine fruits using a chromameter (CR-400 Minolta, Tokyo, Japan) and expressed as L*, a* and b* values using the CIE Lab System. Weight loss was determined before storage (A) and after storage (B), and the weight loss was calculated as (A − B)/A × 100%. Total soluble solids were determined by measuring the refractive index of fruit juice with a hand-held refractometer, and the results were expressed as percentage. Titratable acidity content was measured by titrating 50 mL of the filtered liquid to pH 8.1 with 0.1 M NaOH, and calculated as percent citric acid. Vitamin C content was determined using molybdenum blue spectrophotometry method and the results were expressed as mg 100 g-1 fresh weight (FW). with a molar extinction coefficient of cyanidin-3-galactoside of 2.69 × 104. Extraction and measurement of total flavonoids and total phenolics: Total flavonoids were determined by a colorimetric assay with slight modification. One gram of fruit was mixed with 6 mL 80% ethanol/H2O solution at 4°C in the dark for 24 h, and then centrifuged for 20 min at 12,000 rpm. The supernatant (0.5 mL) was mixed with 0.3mL 8% NaNO2, 0.3 mL 10% Al (NO3)3, 2 mL 2 M NaOH, and 4.9 mL ethanol, and then incubated for 10 min. The absorbance of the solution was assayed at λ510nm by using DU800 spectrophotometer (Beckman, USA). The total flavonoids contents were calculated with rutin as standard, and expressed as mg 100 g−1 FW. Total phenolics were determined by the method of Folin–Ciocalteu procedure with some modifications. Five hundred milligrams of strawberry fruit were homogenized and immersed in 5 mL of extraction with a solution of methanol/water/ hydrochloric acid (80:20: 0.1; V/V/V) for 2 h, and then centrifuged at 12,000 rpm for 20 min. The supernatant of 0.4 mL was mixed with 0.7 mL Folin-Ciocalteus reagent and incubated for 5 min at room temperature. Afterward, 1.5 mL of 12% Na2CO3 was added to the mixture, and incubated for 2h in the dark at room temperature. The absorbance was measured by spectrophotometer at 760 nm. The results are expressed as gallic acid equivalent on a fresh weight basis, mg 100 g-1 FW. Determination of O2•- production and H2O2 content: To determine O2•- production, 2 g of strawberries was homogenized with 4 mL of 50 mM phosphate buffer (pH 7.8). The mixtures were centrifuged at 6000 rpm for 10 min at 4°C. Then the O2•- in strawberries were measured according to the method of Fang (2016). NaNO2 was used for standard curve. The results were expressed as μg g−1 FW. H2O2 content was determined according to the method of Fang (2016) with some modifications. Strawberry samples (2.5 g) were homogenized with 5 mL of cold acetone. The mixtures were centrifuged at 6000 rpm for 10 min at 4°C. Then 1 mL of the supernatant was mixed with 0.1 mL of titanium reagent (5% Ti(SO4)2 in HCl) and 0.2 mL of 250 g L−1 ammonia solution, and washed five times with acetone by resuspension, drained, and re-dissolved in 5 mL of 2 mM H2SO4. The absorbance of the solution was measured at 410 nm. The H2O2 content was calculated as μmol g-1 FW. Determination of antioxidant enzyme activities SOD activity was measured according to the method of Giannopolitis and Ries (1977). One gram strawberries was ground with 5 mL of 50 mM phosphate buffer (pH7.8) containing 1% PVPP and centrifuged at 8000 rpm for 20 min at 4°C. The reaction mixture (3 mL) contained 50 mM phosphate buffer (pH 7.8), 130 mM methionine, 750 μM nitroblue tetrazolium (NBT), 100 μM EDTA-Na2, 20 μM riboflavin and 0.1 mL of enzyme extract. The mixture was illuminated by 4000 LX light at 30°C for 10 min, and then measured the absorbance at 560 nm. One unit (U) of SOD was defined as the amount of enzyme required to inhibit the initial rate of NBT photo reduction by 50%. The SOD activity was expressed as U mg−1 protein. The CAT activity was measured according to the method of Beers et al. (1952). One gram strawberry sample was ground with 2 mL of 0.1 M phosphate buffer (pH 7) in an ice bath. After centrifugation at 6000 rpm for 10 min at 4°C, the supernatant was used to determine CAT activity. The assay was initiated by adding 0.4 mL of extract to the reaction mixture containing 0.8 mL water, 1.5 mL 0.1 M phosphate buffer (pH 7) and 0.3 mL 0.1 M H2O2 at 30°C. The absorbance at 240 nm was then determined for 3 min. One unit of CAT was defined as the amount of enzyme that caused a decrease in absorbance of 0.1per minute. CAT activity was expressed as U mg−1 protein. The POD activity was determined by the method of Hammerschmidt et al. (1982). The strawberry samples of 1.5 g were ground with 2 mL of 0.2 M phosphate buffer (pH 6.8) containing 1% PVPP. After centrifugation at 5000 rpm for 5 min at 4°C, the supernatant was used to determine POD activity. The reaction mixture containing 250 μL of 25 mM guaiacol in phosphate buffer (pH 6.8), 19 mL of 30% H2O2 and 0.5 μL of extract was shaken gently at 30°C. The absorbance at 470 nm was recorded at intervals of 15s for 3 min. One unit of POD was defined as the amount of enzyme that caused a change in absorbance of 0.01 per minute. The POD activity was expressed as U mg−1 protein. The PPO activity was determined by the method of Sulaiman et al. (2015). One and half grams strawberry sample were ground with 4 mL of 0.2 M phosphate buffer (pH 6.8) containing 1% PVPP. After centrifugation at 5000 rpm for 5 min at 4°C, the supernatant was used to determine PPO activity. The reaction mixture containing 250 μL catechol (20 mM) and 0.5 μL of extract was shaken gently at 30°C. The absorbance at 410 nm (Check whether it is 420 nm?) was recorded. One unit of PPO was defined as the amount of enzyme that caused an increase in absorbance of 0.01 per minute. The PPO activity was expressed as U mg-1 protein. Statistical analysis was performed using SPSS software (version 19.0; SPSS Inc. Chicago, IL, USA). Data from experiments were expressed as mean ± standard deviation. Pearson correlations coefficients were estimated among fruit quality and physiological parameters and values of L* and a* of postharvest strawberries. Fruit color is the major quality factor that reflects the fruit ripeness and indicates a fresh-market value of products. In present study, the skin color of strawberry stored at different temperatures was evaluated by determining the changes in L*, a*, and b* values. As shown in (Figure. 1A), the L* values of strawberries generally decreased during storage, and consequently the fruit color turned to darker red color. Increasing storage temperatures accelerated the decrease of L* values, especially for the fruit stored at 35°C. The values of a* and b* had similar change tendency with the L* value. The b* values decreased greatly after 2 days storage (Figure.1B, 1C). The results demonstrated fruit color of postharvest strawberry fruit became dark red, and lost glossiness during the storage period, especially at high storage temperatures that could aggravate the fruit discoloration. Figure 1: Fruit colorimetric parameters: L*(A), a*(B) and b* (C) values of postharvest strawberries during storage at 15°C ( ), 25°C ( ) and 35°C ( ) respectively. Vertical bars represent the standard deviation of three replicates. Weight loss had a negative effect on the visual appearance, resulting in superficial shriveling and less bright color. There was a continuous increase in the weight loss during storage. The more weight losses were observed when fruit stored at higher temperatures, especially at 35°C. At the 8th day, the weight losses of strawberry fruit at 15°C, 25°C and 35°C were up to 11.21 ± 1.02%, 28.83 ± 2.22%, 45.88 ± 2.63 %, respectively. As shown in (Table 1), the total soluble solids of strawberry fruit increased slightly at first and then decreased. The fruit stored at 35°C and 15°C had higher total soluble solids in comparison with the fruit stored at 25°C. The titratable acidity of the fruit at 25°C remained stable, while those of the fruit stored at 15°C and 35°C slightly increased and kept higher levels during storage. Vitamin C contents of the strawberry fruit in this study ranged from 56.10 ± 0.980 mg 100 g-1 FW to 80.26 ± 1.741 mg 100 g-1 FW. Elevated storage temperature could increase vitamin C content in strawberry especially for the fruit stored at the highest temperature of 35°C. Table 1: Quality attributes of postharvest strawberries during storage at 15°C, 25°C and 35°C, respectively. Each value is the mean ± SD, n = 5 replicates for Total soluble solids and n = 3 replicates for weight loss. 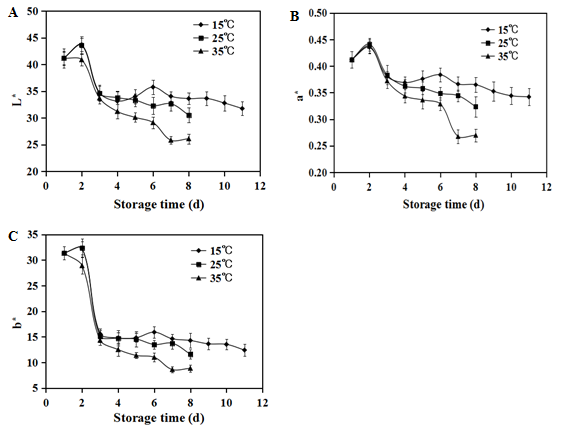 The contents of anthocyanin of strawberry fruit under different storage temperature are presented in (Figure 2A) Noticeable anthocyanin accumulations were observed during storage. The storage temperatures and durations significantly influenced the anthocyanin contents in strawberry fruit. Anthocyanin levels of strawberry fruit stored at 35°C were significant higher than those in the fruits stored at 15°C and 25°C. As shown in Figure.2, the total flavonoids in the fruits increased during the period of storage. The fruits stored at 25°C and 35°C had higher total flavonoids level than those of the fruits stored at 15°C (Figure 2B). 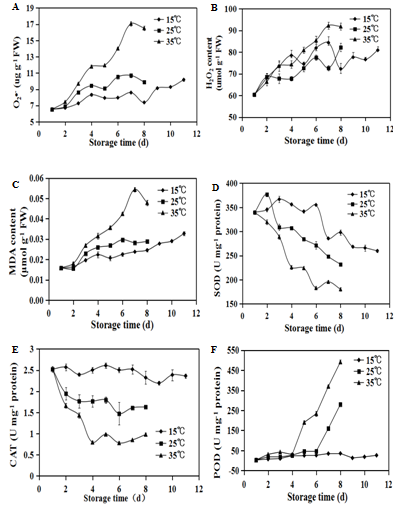 Total phenolics showed the similar increment trend as the total flavonoids of strawberry fruit, the higher storage temperature resulted in more phenolics accumulation in the fruits (Figure 2C). The PPO is a major contributor to the browning of fresh strawberry fruit. As shown in (Figure 2D), the PPO activity in the strawberry fruit stored at 25°C and 35°C were increased greatly and then declined after six days of storage. For the fruits stored at 15°C, the PPO activity remained stable before sixth days, and then increased gradually until the end of storage. The results showed quite evident that samples stored at higher temperature (35°C) had higher PPO activities during storage. Figure 2: Concentrations of total anthocyanins(A), total flavonoids(B) and total phenolics(C) and activity of peroxidase(D) of postharvest strawberries during storage at 15°C ( ), 25°C ( ) and 35°C ( ) respectively. Vertical bars represent the standard deviation of three replicates. The effects of storage temperatures on the ROS production and activities of related enzymes in Strawberry fruit were measured, and the results are shown in (Figure.3). The O2•- production (Figure. 3) and H2O2 content (Figure. 3B) in strawberry fruit increased throughout the storage (Figure. 3 A, B). The fruit stored at the higher temperature kept higher level of both ROS, especially for the O2•-. Consequently, MDA contents (Figure. 3C) in strawberry fruit accumulated consistently, and elevated storage temperatures resulted in more MDA accumulation in strawberry fruit. Figure 3: Productions of superoxide radical(O2•-)(A), hydrogen peroxide (H2O2)(B), accumulation of malondialdehyde (MDA) (C) and activities of Superoxide dismutase (SOD)(D), catalase (CAT) (E) and peroxidase (POD)(F) in strawberries during storage at 15°C ( ), 25°C ( ) and 35°C ( ) respectively. Vertical bars represent the standard deviation of three replicates. The Pearson correlation coefficients among the fruit colors and physiological and quality parameters are presented in (Table 2). The weight loss, contents of vitamin C, anthocyanin, the total flavonoids, the total phenolics, the activities of POD, PPO, levels of O2•- , H2O2 and MDA were negative correlated to the values of L* and a*. Activities of SOD and CAT were positively correlated with values of L*and a*. For the fruit stored the 35°C, the correlation coefficients among weight loss, ascorbic acid, anthocyanin, total flavonoids, total polyphenol, SOD, O2•, H2O2, and MDA to the values of L* and a* were up to 0.9 at P < 0.01. Anthocyanin had highest correlation coefficients with values of L* and a*, followed by ROS, total polyphenol, vitamin C and weight loss. For the fruit stored at 25°C, only anthocyanin, SOD, O2•- and MDA had significant influence on the fruit color, and their correlation coefficients were greater than 0.9 at P < 0.01. Among physiological and quality parameters with values of L* and a*, the fruits stored at 15°C exhibited the lowest correlation coefficients compared with the fruits stored at 25°C and 35°C. These results indicate that storage temperatures could influence the correlation among the color and physiological and quality parameters in strawberry fruit. Table 2: Pearson correlation coefficients and significance of fruit color and internal factors of postharvest strawberries during storage at 15°C, 25°C and 35°C respectively. The temperature is most important environmental factor in the postharvest life of fruit because of it has tremendous impacts on the rate of biological processes, including development of red color and softening of fruit. The present study focused on the key internal factors affecting the fruit color of postharvest strawberry fruit under different storage temperatures. The main physiological and quality characteristics of strawberry fruit stored at different temperatures were evaluated. Increases in L*, a* and b* values of strawberry fruit suggest that fruit color gradually became dark red and lost the glossiness, and the discoloration could be aggravated by elevating storage temperature. The similar results were reported in postharvest cherry and mangostana fruit[25-28]. Anthocyanins have been proposed as important compounds in tolerance response of plant to abiotic stress and their accumulation is also an important biological event during fruit ripening. Anthocyanin accumulation was observed during the storage of plum, grape and strawberry fruit, and high temperatures could result in acceleration of its accumulation[29-33]. In the present study, anthocyanin accumulation with a temperature-dependent mode was observed in the harvested strawberry fruit To explore the possible relationship between fruit discolorationand anthocyanin accumulation, Pearson correlation analysis was performed and the results indicate that anthocyanin content had significant negative correlation with L* and a* values of postharvest strawberry fruit, further analysis revealed that correlation coefficient of anthocyanin to L* value was the highest among all the tested physiological and quality parameters. Goncalves et al. (2007) also found L*, a*, b*, chroma and hue angle correlated negatively (P < 0.001) with the total anthocyanins levels in the sweet cherry fruit. In addition, we found that the correlation of anthocyanins to L* value at higher storage temperatures was more significant in strawberry fruit during storage. The results suggest that anthocyanin accumulation might be the most important internal factor leading to the discoloration of postharvest strawberry fruit during storage, Water loss from the fruit had diverse effects on the visual appearance, resulting in superficial shriveling and less bright color. In this study, the weight loss of strawberry fruit increased significantly during storage, and the high temperature promoted the more weight losses of the fruit. Statistical analysis results showed that the weight loss had significant negative correlations with values of L* and a*, meanwhile the negative correlation was enhanced with the increment of the storage temperature. These results suggest the weight loss was the one of the key factors leading to discoloration of postharvest strawberry, especially in the high temperature environment. The ROS accumulations are considered as an important cause of cellular oxidation and consequent membrane lipid peroxidation, linking to fruit ripening and senescence. In present study, there were significant increase of the O2•-, H2O2 levels in strawberry fruit during storage, and the high storage temperatures triggered more ROS production. The over-produced ROS induced membrane lipid peroxidation and MDA accumulation. Recent studies have shown that browning development in harvested fruits and vegetables might be attributed to the accumulation of ROS, lipid peroxidation of membrane, and the damage of cellular membrane structure[36-38]. Moreover, the outburst of ROS stimulated the phenolics accumulations as well as the increments of PPO and POD activities in fruit, which led to browning of strawberry fruit. Further statistical analysis showed levels of the O2•-, H2O2, MDA, total polyphenol, and PPO activity had significantly negative correlations with L* and a* values of strawberry fruit, and the correlations are more significant at higher storage temperature. The accumulations of ROS in the strawberry fruit during storage enhanced membrane lipid peroxidation, which interrupted cellular compartmentalization and led to the contact of PPO with phenolics substrates, and consequently induced browning and darkening of strawberry fruit. Such processes of browning and darkening could be aggravated by higher storage temperature. This study demonstrated that fruit color of postharvest strawberry fruit became dark red and lost the glossiness during storage, and higher temperature aggravated of the process of discoloration. Further statistics analysis indicates that anthocyanins might be the most important internal factors leading to postharvest strawberry discoloration. ROS accumulations accelerated the oxidization of phenolic compounds and resulted in the fruit browning, which acted as another key factor related with the discoloration of strawberry fruit during storage. In addition, weight loss also had a close relation to the fruit discoloration. Higher temperature aggravated the changes of these key factors, which could exert many impacts on the fruit color. Based on present study, the results suggest that fruit color of postharvest strawberry fruit could be maintained by means of delaying the accumulation of anthocyanins, maintaining the antioxidant activity, and reducing the water loss during storage. This work was financially supported by the National Key Basic Research Program of China (No.2013CB127100). 1. Giampieri, F., Tulipani, S., Alvarez-Suarez, J.M., et al. The strawberry: composition, nutritional quality, and impact on human health. (2012) Nutrition 28(1): 9-19. 2. Miao, L., Zhang, Y., Yang, X., et al. Colored light-quality selective plastic films affect anthocyanin content, enzyme activities, and the expression of flavonoid genes in strawberry (fragaria×ananassa) fruit. (2016) Food Chem 207: 93-100. 3. Akhatou, I., Fernándezrecamales, A. Nutritional and nutraceutical quality of strawberries in relation to harvest time and crop conditions. (2014) J Agric Food Chem 62(25): 5749-5760. 4. Hamadziripi, E.T., Theron, K.I., Muller, M., et al. Apple compositional and peel color differences resulting from canopy microclimate affect consumer preference for eating quality and appearance. (2014) Hortscience 49(3): 384-392. 5. Nunes, M.C.N., Emond, J.P., Brecht, J.K. Quality of strawberries as affected by temperature abuse during ground, in-flight and retail handling operations. (2003) Acta Horticulturae 604: 239-246. 6. Kalt, W., Prange, R.K., Lidster, P.D. Postharvest color development of strawberries: influence of maturity, temperature and light. (1993) Can J Plant Sci. 73(2): 541-548. 7. 7. Nunes, M.C.N., Brecht, J.K., Morais, A.M.M.B. Possible influences of water loss and polyphenol oxidase activity on anthocyanin content and discoloration in fresh ripe strawberry (cv. oso grande) during storage at 1°C. (2005) J Food Sci 70(1): S79-S84. 8. Shin, Y., Ryu, J.A., Liu, R.H., et al. Fruit quality, antioxidant contents and activity, and antiproliferative activity of strawberry fruit stored in elevated CO2, atmospheres. (2008) J Food Sci 73(6): 339-344. 9. Sun, Y., Qian, M., Wu, R., et al. Postharvest pigmentation in red Chinese sand pears (Pyrus pyrifolia, Nakai) in response to optimum light and temperature. (2014) Postharvest Biol Tec 91: 64-71. 10. Steyn, W.J., Holcroft, D.M., Wand, S.J.E., et al. Regulation of pear color development in relation to activity of flavonoid enzymes. (2004) J Am Soc Hortic Sci 129(1): 6-12. 11. Liu, C.H., Liu, Y. Effects of Elevated Temperature Postharvest on Color Aspect, Physiochemical Characteristics, and Aroma Components of Pineapple Fruits. (2014) J Food Sci 79(12): 2409-2414. 12. Liu JH and Li JT, The experiment research about some fruits and vegetables keeping fresh in magnet. (1999) J Yunn Norm Univ 19:64-65. 13. Larrigaudière, C., Pons, J., Torres, R., et al. Storage performance of clementines treated with hot water, sodium carbonate and sodium bicarbonate dips. (2002) J Hortic Sci Biotech 77(3): 314-319. 14. Wright, K.P., Kader, A.A. Effect of controlled-atmosphere storage on the quality and carotenoid content of sliced persimmons and peaches. (1997) Postharvest Biol Tec 10(1): 89-97. 15. Xie BJ and He H, Food Analysis, Science Press, Beijing, pp. 228 – 232 (2009). 16. Wolfe, K., Wu, X., Liu, R.H. Antioxidant activity of apple peels. (2003) J Agric Food Chem 51(3): 609 – 614. 17. Jia, Z., Tang, M., Wu, J. The determination of flavanoid contents on mulberry and their scavenging effects on superoxide radical. (1999) Food Chem 64(4): 555-559. 18. Du, H., Wang, Y., Hao, X.J., et al. Antimicrobial phenolic compounds from Anabasis aphylla L. (2009) Nat Prod Commun 4(3): 385–388. 19. Fang, D.L., Yang, W.J., Kimatu, B.M., et al. Effect of nanocomposite packaging on postharvest quality and reactive oxygen species metabolism of mushrooms (Flammulina velutipes). (2016) Postharvest Biol Tec 119: 49-57. 20. Liu, J., Wu, Y.C., Kan, J., et al. Changes in reactive oxygen species production and antioxidant enzyme activity of Agaricus bisporus harvested at different stages of maturity. (2013) J Sci Food Agric 93(9): 2201-2206. 21. Giannopolitis, C.N., Ries, S.K. Superoxide dismutases: I. Occurrence in higher plants. (1977) Plant Physiol 59(2): 309-314. 22. Jr, B.R., Sizer, I.W. A spectrophotometric method for measuring the breakdown of hydrogen peroxide by catalase. (1952) J Biol Chem 195(1): 133–140. 23. Hammerschmidt, R., Nuckles, E.M., Kuć, J. Association of enhanced peroxidase activity with induced systemic resistance of cucumber to Colletotrichum lagenarium. (1982) Physiol Mol Plant P 20(1): 73–76. 24. Sulaiman, A., Ming, J.S., Yoon, M.M.L., et al. Modeling the polyphenoloxidase inactivation kinetics in pear, apple and strawberry purees after high pressure processing. (2015) J Food Eng 147: 89–94. 25. Sooriyapathirana, S.S., Khan, A., Sebolt, A.M., et al. QTL analysis and candidate gene mapping for skin and flesh color in sweet cherry fruit (Prunus avium L.). (2010) Tree Genet Genomes 6(6): 821–832. 26. Cordenunsi, B.R., Genovese, M.I., Jrodo, N., et al. Effects of temperature on the chemical composition and antioxidant activity of three strawberry cultivars. (2005) Food Chem 91(1): 113–121. 27. Holcroft, D.M., Kader, A.A. Controlled atmosphere-induced changes in pH and organic acid metabolism may affect color of stored strawberry fruit. (1999) Postharvest Biol Tec 17(1): 19–32. 28. Palapol, Y., Ketsa, S., Stevenson, D., et al. Colour development and quality of mangosteen (Garcinia mangostana, L.) fruit during ripening and after harvest. (2009) Postharvest Biol Tec 51(3): 349–353. 29. Chalker-Scott, L. Environmental significance of anthocyanins in plant stress responses. (1999) J Photoch Photobio 70(1): 1–9. 30. Martinez-Romero, D., Zapata, P.J., Guillen, F., et al. The addition of rosehip oil to Aloe gels improves their properties as postharvest coatings for maintaining quality in plum. (2017) Food Chem 217: 585-592. 31. Flores, G., Blanch, G.P., del, Castillo, M.L.R. Postharvest treatment with (-) and (+)-methyl jasmonate stimulates anthocyanin accumulation in grapes. (2015) LWT-Food Sci Technol 62(1): 807-812. 32. Zhang, J., Watkins, C.B. Fruit quality, fermentation products, and activities of associated enzymes during elevated CO2 treatment of strawberry fruit at high and low temperatures. (2005) J. Amer. Soc Hort Sci 130(1): 124–130. 33. Shin, Y., Liu, R.H., Nock, J.F., et al. Temperature and relative humidity effects on quality, total ascorbic acid, phenolics and flavonoid concentrations, and antioxidant activity of strawberry. (2007) Postharvest Biol Tec 45(3): 349–357. 34. Goncalves, B., Silva, A.P., Moutinho-Pereira, J., et al. Effect of ripeness and postharvest storage on the evolution of colour and anthocyanins in cherries (Prunus avium L.). (2007) Food Chem 103(3): 976-984. 35. Yang, S.Y., Su. X.G., Prasad, K.N., et al. Oxidation and peroxidation of postharvest banana fruit during softening. (2008) J Am Chem Soc 47: 3964-3971. 36. Saquet, A.A., Streif, J., Bangerth, F. Energy metabolism and membrane lipid alterations in relation to brown heart development in ‘Conference’ pears during delayed controlled atmosphere storage. (2003) Postharvest Biol Tec 30(2): 123–132. 37. Yi, C., Jiang, Y., Shi, J., et al. Effect of adenosine triphosphate on changes of fatty acids in harvested litchi fruit infected by Peronophythora litchii. (2009) Postharvest Biol Tec 54(3): 159–164. 38. Zhang, Z., Huber, D.J., Qu, H., et al. Enzymatic browning and antioxidant activities in harvested litchi fruit as influenced by apple polyphenols. (2015) Food Chem 171: 191-199.